Being a Memphis native, I love Elvis impersonators. They’re like friendly clowns. I’ve seen them picking out fruit at the grocery store, passed them walking down Beale, and cut off their Cadillacs in traffic. I’ve lived among them and they’re still a thrill. It’s a whole other slightly more embarrassing thing to admit that I love the entire genre of which Elvis impersonators are a subset—the cover band. I rode on an airplane with an Elvis impersonator during Dead Week. His name was Irv Cass. I didn’t have to ask if he was an Elvis impersonator, because he was Elvis. He sat on the plane reading tabloids aloud in deep, rich, Presley (say it right: Prez…ley) tones and a sugary Memphis drawl, commenting on the moral lessons to be learned from the life of Pamela Anderson. An Elvis impersonator pontificating on Pam Anderson’s fake breasts. The irony. The common line of thought is this: the editors of In Touch aren’t up to producing legitimate news on a weekly basis so they manufacture unfounded gossip about celebrities that only ignorant people would believe. Similarly, cover bands aren’t up to writing original music so they crapily recycle the music of famous, much-beloved artists, a travesty that would appeal only to the musically ignorant. This would be where the common line of thought is stupid. Because the best arguments are always founded on the bedrock of Elvis impersonation, we begin with the Elvi. I will admit that Elvis impersonators are inherently ridiculous. I love them, but I can’t help remembering the 1989 Bill Bixby-hosted television special Elvis, Where Are You?—two hours based on an impressive collection of Elvis phone recordings (ie. adolescent prank calls conducted with perfect Presley pitch) and Elvis sightings (ie. impersonators caught on tape by gullible Michiganders) that left me convinced the King was indeed alive and living in Kalamazoo. But this only represents the fringes of the Elvis cult. There’s more to impersonation than being caught leaving the Citgo and mistaken for the living King. It may be a knock-off, but impersonation is far from simple. Beneath the pagentry and the kitsch lies a more sophisticated art. 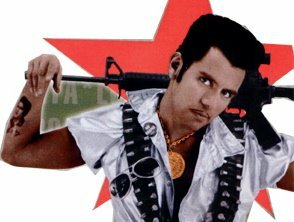 El Vez, “the Mexican Elvis,” uses Presley’s songs as a springboard, pilfering the music but including his own original lyrics about immigration, political empowerment, and racial dissent. He manipulates Presley as a metaphor of empowerment, superimposing Hispanic culture onto Elvis’ iconic life as the quintessential American Dream. If you can get beyond the cheesy album covers and the fact that he’s “The Mexican Elvis,” you’ll find the same sentiments that resonate through the entire catalogue of highly respected bands like U2. Knock-offs aren’t always as superficial as they seem. Obviously, there’s much more to a cover band than the derogatory term implies. A cover band is a tribute, a celebration, an homage, an impersonation, a theatrical, a performative art. They represent the real thing, the genuine article. As the Elvis tribute artist, Irv Cass says, “It’s as close as you can come to reality.” In other words, impersonation is the realest fake. And being this fake is a hell of a lot of hard work. Vertigo USA, a Chicago U2 tribute band, has shelled out its own money to buy gear worthy of Bono and the lads. Vertigo puts on a damn good U2 show. Juggling day jobs, side projects, and families, the band members tour the country on their own dime, because they love the music that much. There’s something to be said for loving something that much, and I think an integral element of impersonation is that love, of either the music or the icon. Openly and loudly and unabashedly—regardless of the cultural validity, social acceptability, or the sheer cheesiness of what you’re doing—loving something that much. Because it’s a taxing job, one that demands the vocal skill, musical talent and stamina of a top-notch performer. The cover band is very much a case of tough love. I interviewed Faux Bono (Alan Lewis) this summer. He didn’t come in character. Watching Faux Bono eating a pretzel, you wouldn’t have thought: BONO! Watching him onstage an hour later, you couldn’t think anything else. Faux Bono’s mimickry of Bono’s moves was without flaw. He clutched his shirt cuffs, thrust his hips, prowled the stage, strutted into the crowd, swaggered across the floor. He’d recently gone from playing Jesus in Godspell to being Bono. But he swore he didn’t have a messianic complex. Faux Bono’s dead-on impersonation did not come naturally. It took a lot of hard work. The obsession started when he found a rogue copy of Achtung Baby in the bargain bin. From then on, Faux Bono screened U2 concerts, practicing the mannerisms, trotting out the stage moves at kareoke bars. He would snag someone’s sunglasses and sing his heart out. One night, a drunk guy leaned in and said, “Boy! I hope you’re able to do something with that one of these days.” At a Vertigo show, you wonder how he could have possibly done anything else. The kid is Bono through and through. Faux Bono told me that as Bono, all he wants to do is to make people forget they’re not seeing the real thing. It’s an illusion very much complicated by the fact that Vertigo is, in reality, playing small pubs and bars, not 25,000 seat stadiums. Faux Bono says he gets through it by asking himself, “What would Bono do if he was playing here right now?” Watching him, you wouldn’t guess he had to think about it at all. Done well, impersonation looks easy. Like modern art, we think: I could do that. Look. Watch me. I’ll do it right now. Truth is, very few of us could. Because we don’t love either the icon or the music that much. We don’t love U2 enough to stay home and drink tea and take care of our voices and practice. We don’t love Elvis’ “Suspicious Minds” enough to fork over our own money for tour expenses and advertising and rhinestone jumpsuits. Like any art—and it is an art—impersonation is demanding and difficult and the only reason it ever looks easy is because the artist is just that good. Impersonation is deception. Faux Bono is not Bono. Irv Cass is not Elvis. But they almost are. They’re authentically fake. They’ve studied hard. The sugary Memphis drawl of Irv Cass lulled my thoughts back to sticky southern summer barbeques along the mighty Mississippi. It was a drawl so lilting, so smooth, so velvety, that it was shocking to know it came from a Detroit native. But we overlook the deceit. I’ve seen two separate Neil Diamond tributes. One Faux Neil even carried on stage-banter about his “good friend Barry Manilow” before breaking into a cover of “Mandy.” Yes, a Neil Diamond cover band covering Barry Manilow’s “Mandy.” So meta. And no one stood up to accuse Faux Neil of being an evil liar and duping us all. We didn’t feel cheated that he didn’t really know Barry and that he might not even know a Faux Barry, because it’s implicit in the cover band viewing contract that there will be a pretty significant suspension of disbelief. And we were cool with that. We knew the rules. Impersonation is inevitably a failed deception. Despite the effort at verisimilatude, there’s no escaping the fact that masquerading as another band or another person is an obliquely fake enterprise. This falsity is most often betrayed by anachronisms, which are, in turn, largely responsible for the fundamental kitschiness surrounding cover bands. Elvis died at 42, Irv Cass is now 53. Faux Neil, the dear friend of Barry Manilow, was decked out in glittery scarves and low-cut blouses, but sang accompanied onstage only by the saddest of boomboxes. Even Vertigo’s U2 tribute, of which I’m an ardent fan, is a little off. Sometimes Faux The Edge is dressed in Joshua Tree-era garb, while Faux Bono is decked out à la Zoo TV. So impersonation is not perfection. And that’s the one thing that those who can’t handle the kitsch will be the first to point out. That people no longer love “Mandy,” jumpsuits are not cool, and Elvis is dead. But, ultimately, it’s the imperfections that are most interesting within cultural artifacts: the dissonance between interpretations, the stories we believe that turn out to be untrue. It is the fictions that best capture the overarching values and dramas of the society that created them. We can only see so far on our own, while fiction affords a sweeping, panoramic cultural view. Cover bands are a living interpretation of a cultural icon. The impersonator captures the sound, movements, and image of the icon, even after the individual behind that image has long since passed away. It’s tableaux vivant for the modern age. To me, the most fascinating element of impersonation is that process of deceiving to recreate a reality or an image. Because in reality, if we deceive, we are condemned. What is acceptable on a stage will not be tolerated in life. And yet, we all pretend. To an extent, we are all fictitious, we are all performing. We pretend through friendships, marriages, careers, hope and fear. We pretend we’re happy when we’re sad. We laugh when we want to cry. We remain silent when we want to kick and scream. But unlike impersonators, we are not onstage. We are real, the impersonators are fake. And somehow they seem more honest. richard nixon was not jfk. this is the fundamental truth with which richard nixon wrestled. that he was a nobody. a kid with a bad childhood and an inferiority complex the size of south america. a poor quaker with no pulitzer and no father with enough money to buy him one. a paranoid peon who was robbed of the presidency by perspiration. a sad, lonely man who climbed to the top only to screw up all he had finally won. he seems never to have been young. look back at the pictures. he was always worn down. the five o’clock shadow at 10 a.m. the gullies beneath the eyes. the trenches around the mouth. the man looked 60 when he was barely 35.
look at the kennedy debate- they are contemporaries. it was kennedy who lived every day at death’s door and yet you can practically hear the death rattle in nixon’s bitter arthritic bones. he was a man who never fit in. anywhere. ever. he belonged in an age where the ascension to power was more brutal. where it demanded bloodshed and deceit. he could’ve played hardball with henry viii. he would’ve poisoned the king’s bastards. but nixon was a thoroughly medieval man trapped in modern times. a man living in the age of television who looked utterly horrid on tv. 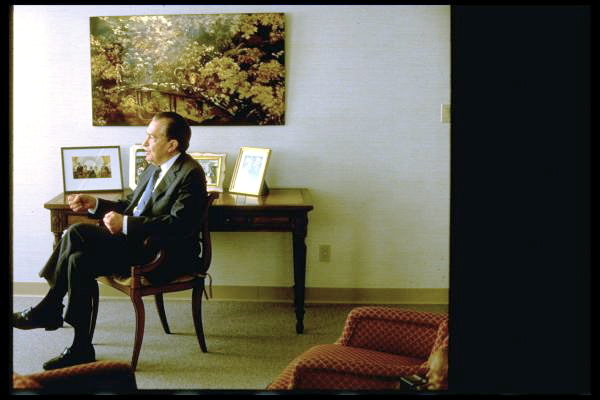 it’s a testament to the american dream that richard nixon could become president. it’s a testament to the tragedy that was richard nixon that he blew it every single time. perhaps my heart was softened by the blurb in time describing how he and jackie passed notes back and forth from their deathbeds. or the funeral, where all the living presidents looked embarrassed and sheepishly bored, shaken by the vivid reminder that one can rise from nothing and, all on one’s own, plummet right back down. there was something wrong in that. in their embarrassment and shame. some lack of the respect that, admittedly, wasn’t due, but had been agonizingly, debasingly earned. the man who had suffered a thousand political deaths was gone. this seemed somehow monumental. my heart belongs to nonfiction. sometimes i feel i am alone in this, thus, i must periodically be all yay! rah! and mount an unsolicited defense. any fiction i’ve ever attempted has been complete pretentious crap. but, for the most part, the writing process isn’t so different. yes, there are the safety nets of notecards and quotes and the nonfic-specific unexpected pitfalls- the uncited factoid and (horror of horrors!) the apocryphal anecdote. but there are also the same scary moments of where are we going here? and the epiphanies where everything suddenly falls into place. nonfic is very peter pan. it’s an ancient genre but an exceedingly immature one. the only true standard is that biography is more about the biographer than the subject, which is a rather pathetic standard since it so clearly needs to be the other way around. nonfiction has limits that writers simply aren’t pushing. it’s a form older than the novel but one with which all too few liberties have been taken. which is why there is still this stereotype. this lingering sense that fiction is the artistic end-all and nonfic is simply it’s easy sister. that, because you’re working with a real life that has already been lived and real events that have already happened, everything is neatly plotted out and tied with a bow. that notion couldn’t be further from the reality. because writers of nonfic are dealing with reality, and reality- though it may appear concrete- is an ephemeral patchwork of contrasting impressions. and that’s a hell of a hard thing to pin down. nonfic is intimate and personal and intrusive. and it’s more than a little gauche- to be peeking through people’s love letters and into their bedrooms and between their sheets. to be supposing what they were thinking. because we never know what anyone is thinking- even the people we know, much less people we don’t. but that is precisely nonfiction’s beguiling allure. this sense that you can become acquainted with someone from the past, that you can learn from them and understand them without knowing them. because they are characters. and when you write about these characters, they are uniquely yours. they become a tiny piece of your own makeup. in real life, people are inconsistent. they change direction and marry precipitously and say mean things and screw up their kids. they are almost always misunderstood. in fiction, you’re at ease to plot around that. that, in and of itself, may be your plot. in nonfiction, you’re working in spite of it, which is a terribly humbling thing. you must nancy drew your way through twelve different versions of the same event spun twelve entirely different ways to find some shard of the way it really might have been. it’s like pulling at a strand of tangled hair. sometimes you can coax it apart. sometimes you just rip the damn thing out. jackie and i have had some major throwdowns. moments where she said completely atrocious things at random deathbeds and left me to make sense of these incomprehensible actions. things that my jackie would never have done but jackie did them nonetheless. and there’s no avoiding them, because they are what made her jackie. it’s scary. that moment when your character goes out of character and you’re left staring at a stranger you know everything about but never knew. and you curse her and fight to find the words and write a whole heap of paragraphs trying to justify this one little inexplicable blip in a character so otherwise explicable. and then you delete the whole lot and let her win. and maybe that’s the difference. fictioneers fight their characters to win. in nonfiction, you fight the good fight and then you let them be.